I just got me newest Zentangle books! I got an Amazon gift card for my birthday and used it on some new books to feed my addiction. I can't wait to get into them and see what new things I can learn. 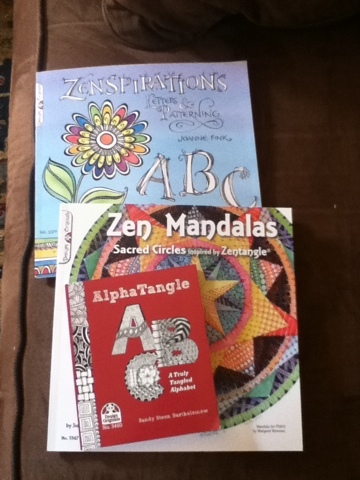 I got the new edition of AlphaTangle by Sandy Steen Bartholomew, Zen Mandalas by Suzanne McNeill and Zenspirations by Joanne Fink. After just a peek in each book I can see there is a lot for me to learn and tons of inspiration!